Men work on a natural gas drilling platform on Dec. 18, 2008, in the Barnett Shale in Fort Worth, Texas. A floor crew pull steel pipe out of a natural gas well on Dec. 16, 2008, in the Barnett Shale of Fort Worth, Texas. Natural gas production in the United States is booming: Since 2005, it has increased by 35 percent,1 and with each passing year the country burns more gas, and less coal and oil. Natural gas emits far less carbon dioxide than coal or oil, and the gas boom has driven a decline in U.S. carbon dioxide emissions over the past decade. The boom stems largely from the shale gas revolution, in which hydraulic fracturing and horizontal drilling (“fracking”) allows recovery of natural gas and petroleum trapped in underground shale formations. Policymakers have hailed this revolution as beneficial in the fight against climate change, but natural gas does have a dark side: It is composed primarily of methane, which has a much stronger climate-warming effect than carbon dioxide. Unburned methane that leaks into the air from anywhere in our natural gas infrastructure has a potent climate-warming effect, and global methane levels have been steadily increasing since 2007. 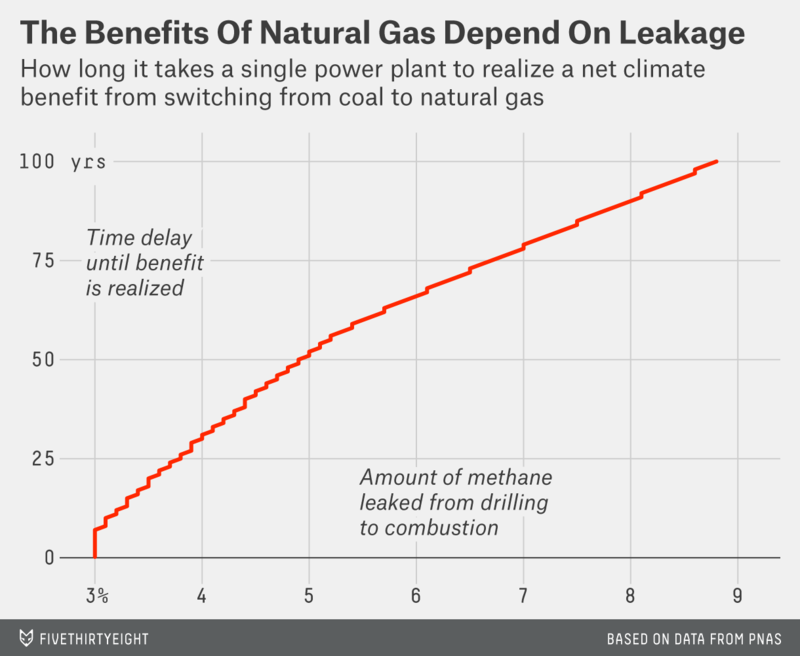 The only way to know whether switching to natural gas will worsen climate warming, rather than lessen it, is to accurately assess the scale of methane leakage. Since the issue first rose to prominence following a 2011 study, numerous research groups have sought to get a handle on methane leakage. In the past year alone, several high-profile studies have been published, each using a different methodology and some reaching widely differing conclusions. The scientific community is far from consensus on the topic, but a look at the available data is illuminating, and perhaps alarming. Experts differ on two distinct questions about methane leakage: First, from a climate perspective, how much leakage is too much? And second, how much methane leakage is actually occurring? Even the first question is difficult to answer, because the relative impacts on the climate of methane versus carbon dioxide depend entirely on the timeframe we choose to study. Although methane is a more potent greenhouse gas than carbon dioxide, it doesn’t stick around very long — it eventually turns into carbon dioxide via oxidization in the atmosphere. So if you ask, “How much will methane emitted today affect the climate 20 years from now?” you get one answer (quite a bit), but if you ask about its climate effect 100 years now, you get a different answer (not as much). Big differences among studies of methane leakage’s impacts can be due entirely to the timescale used: Analyses based on a 20-year timescale will always see methane leakage as a more serious climate problem than analyses based on a 100-year timescale. The choice of timescale depends on how a scientist views earth as a system. Many experts have suggested that potential “tipping points” exist for the climate. That is, once global temperatures rise above a certain threshold, they will cause irreversible changes in the climate system that then further accelerate the pace of warming. If we’re currently approaching such a tipping point, a shorter timescale may be more appropriate for a methane leakage analysis. I’m going to describe the results of several recent studies below, but here’s the best way to summarize their implications for the climate: If there’s a possibility that earth could pass a climate tipping point in the next 15 to 50 years, as many scientists believe, then current levels of methane leakage from U.S. natural gas systems are likely to push us toward that tipping point faster as we increasingly switch to natural gas. This problem exists even though burning natural gas emits less carbon dioxide than burning any other fossil fuel. Furthermore, the methane leakage problem was entirely overlooked in a proposed rule to reduce carbon emissions from power plants that the Obama administration announced in June. A 2012 study published in the Proceedings of the National Academy of Sciences by Ramón A. Alvarez et al. showed how the amount of natural gas leaked affects when we start to see the benefits of switching from a coal power plant to a natural gas power plant.2 Here I have updated the researchers’ results to reflect new standards for the climate-warming effects of methane that were published by the Intergovernmental Panel on Climate Change in 2013.3 If less than about 3 percent of the natural gas leaks out on its way from the wellhead to a power plant, the climate begins to benefit immediately from the switch. But at 5 percent leakage, the climate won’t begin to benefit for more than 50 years. That means for those first 50 years, the climate impact of switching from coal to natural gas is a net negative: The warming effect of 5 percent leaked methane is stronger than the benefit of emitting less carbon dioxide from the coal-fired power plant. How much methane is being leaked today? The U.S. Environmental Protection Agency provides estimates of methane leakage quantities (not percentages) from natural gas production in technical reports known as inventories. Researchers have used these inventories to generate estimates of overall leakage percentages for the natural gas industry. One study using the 2013 EPA inventory estimated an overall leakage rate of 1.8 percent for the U.S. natural gas system. That may sound promising, but the bad news is that multiple independent studies have concluded that EPA inventories systematically underestimate methane emissions. The EPA creates inventories by collating emissions data reported to it from industry sources and adding them together. Most of the researchers who disagree with EPA inventories of methane emissions instead measure methane concentrations in the air by using monitoring stations on the ground and on telecommunications towers or measurements collected by aircraft. For example, a December 2013 study measured methane concentrations across the entire United States and concluded that the EPA underestimates national methane emissions (from all sources, not just natural gas) by a factor of 1.5. The same study also found an especially high discrepancy between measured methane concentrations and the EPA inventories in the south-central region of the U.S., which includes Texas, Oklahoma and Kansas. These states are among the top natural gas producers; fracking was pioneered in Texas’s Barnett shale. The study estimated that actual methane emissions from this region are almost five times greater than EPA inventory data shows, and concluded that these three states alone accounted for 24 percent of all U.S. methane emissions. Because measurements of tracer compounds found only in natural gas were similarly elevated, the study concluded that natural gas production was the primary source of methane in this region. Building on these findings, a paper published in February reviewed nearly 20 studies and found that “official inventories consistently underestimate actual methane emissions.” Based on the data reviewed, the authors put upper and lower boundaries on methane leakage from natural gas infrastructure at 3.6 percent and 7.1 percent. Although this is a wide range, the study still concluded that switching from coal to natural gas for power plants results in a net benefit for the climate — because the researchers used the 100-year timescale. Had they used a 20-year timescale, their conclusion would have been quite different: At the lower bound, a 3.6 percent leakage rate means at best a break-even scenario for the climate over 20 years. Somewhere in the middle, an April 2014 study using aircraft measurements over production sites in the Marcellus shale in Pennsylvania found methane emissions to be similar to EPA inventory estimates. Yet this study also discovered surprisingly high emissions during the drilling phase, before the well was complete and had begun producing natural gas. Although drilling was once thought to emit minimal methane, the study measured levels that were 100 to 1,000 times higher than EPA inventories. It’s fair to say that the jury is still out on whether fracking results in more methane leakage than traditional gas drilling, but so far, the evidence suggests that fracking may indeed be releasing alarming amounts of methane into the atmosphere. What should this mean for policymakers? The shale gas juggernaut cannot be stopped, but methane leakage could certainly be monitored and reduced. For example, states with major gas operations such as Texas, Louisiana, Pennsylvania and Oklahoma could include methane leakage monitoring in their regulatory programs. Likewise, New York Gov. Andrew Cuomo is expected to decide whether, where and how to allow fracking in his state. His decision will surely focus on potential direct threats to public health, like drinking water contamination, but he could decide to include methane monitoring in any fracking that’s permitted. At the federal level, the EPA issued new rules in April requiring companies to capture gas that would otherwise be vented during fracking. These new rules will go into effect in 2015, but any actual monitoring of methane emissions would be up to the states. Calculated for 2005 to 2013 based on U.S. Energy Information Administration natural gas production data. Assuming a 50-year service life of the power plant. Specifically, the indirect radiative forcing by methane due to its effects on stratospheric ozone increased in the 2013 IPCC report relative to the 2007 IPCC report that Alvarez et al. used as the basis for their estimate of the “radiative efficiency” (RE) of methane. Alvarez et al. used an RE for methane of 102; I used the 2013 IPCC report to calculate an analogous RE value of 110, which I used in generating the chart for this article. This study also included a laundry list of “conflicts of interest” declared by the authors, mostly in the form of consulting and advisory roles for the oil and gas industry. This study also identified an alarming geographic pattern: Wells in northeastern Pennsylvania had a particularly high incidence of problems, with more than 9 percent of unconventional wells reporting integrity problems in both the pre-2009 and post-2009 time periods.